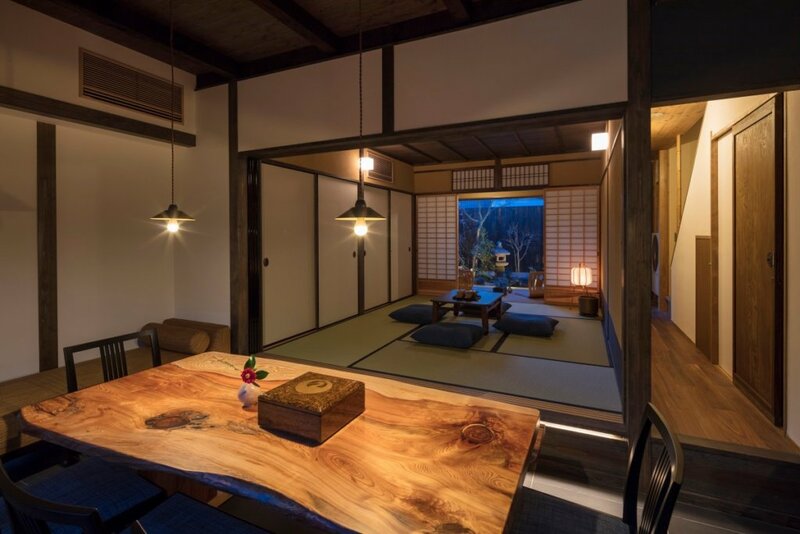 Large sliding doors are designed with a pattern that conjures up images of moonlight shining through the evening clouds-- a design reminiscent of the machiya's name, “Geppaku-an”. 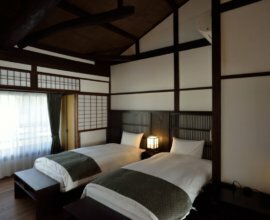 Although Geppaku-an is located on the main street of Sanjo-dori, this kyo-machiya house is surrounded by a calm and peaceful atmosphere. 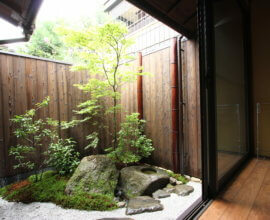 To the East is a small river, and lush green trees that surround the “Nanzenji Incline”. Walk a little North of your machiya house to visit Heian Jingu Shrine -- a large shrine complex that is famous for its cherry blossom trees & autumn festival, “Jidai Matsuri”. 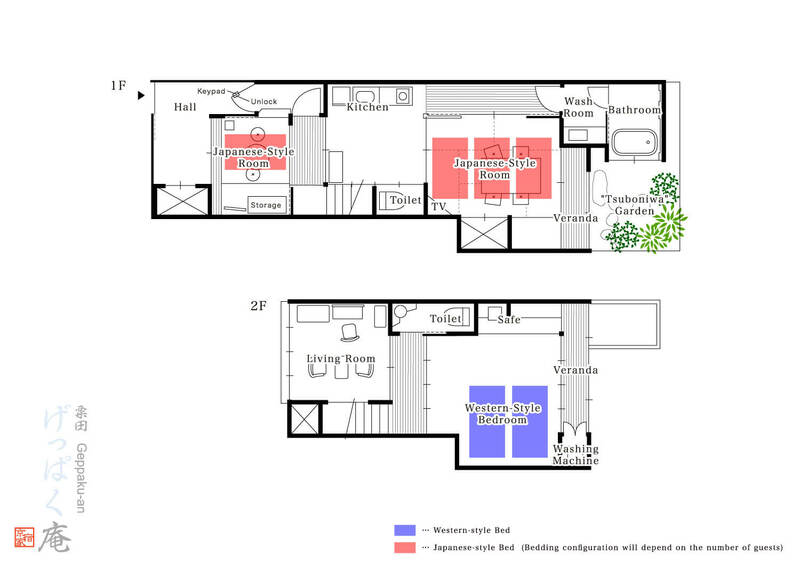 A Quiet Retreat Though located along a lively street, the machiya's exterior is designed to create a peaceful interior. 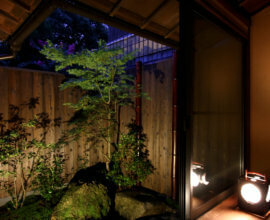 Behind the facade, pass an inner courtyard before entering your machiya. 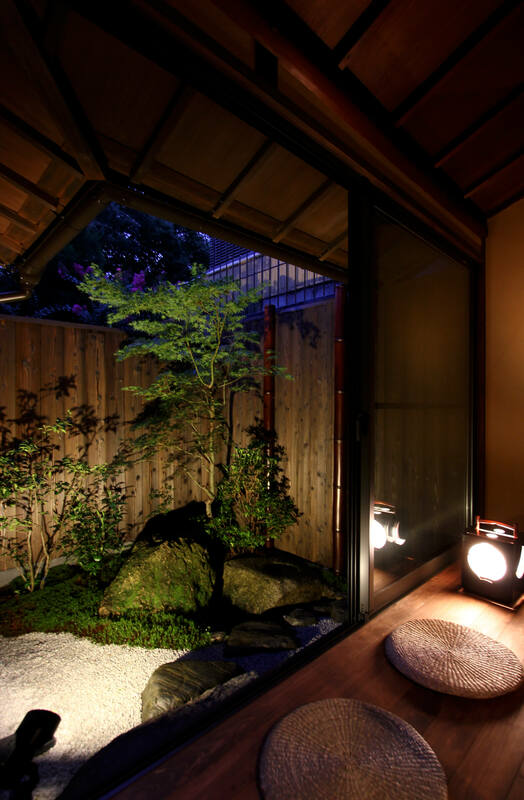 The Colour of Moonlight Enjoy the traditional 'fusuma' sliding doors throughout Geppaku-an. They are covered in delicate designs in silvery blue colours to remind you of the colour of moonlight. Stunning Bedroom Slide open the silver 'fusuma' doors to a spacious bedroom with a Japanese alcove and antique furniture. Warm lighting against the high ceilings and wood beams illuminates the architecture. Sitting Room A cozy, sunlight-filled room with leather sofa chairs, stained glass and classic antiques is the perfect place to unwind with a book or plan the day ahead. Living Room Gather in this spacious room reminiscent of a tea ceremony room. 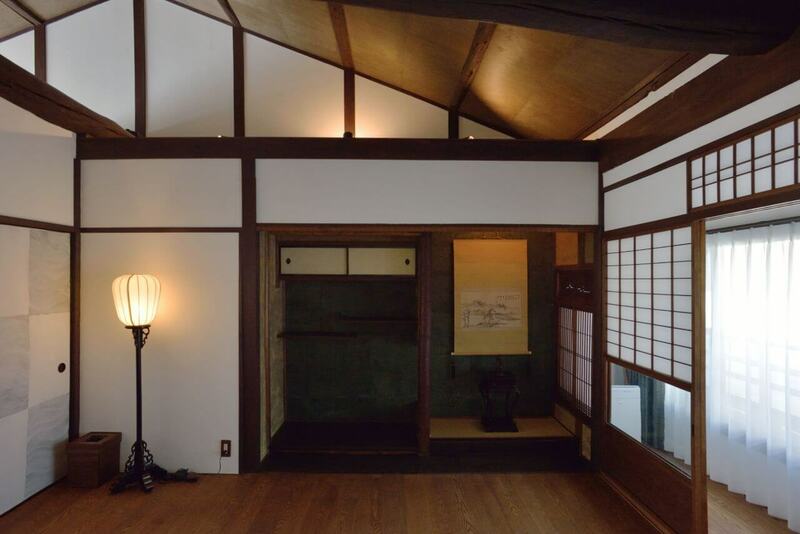 From the art alcove, 'shoji' paper screens, pale blue 'fusuma' doors and garden view, take in a quiet moment here. Bathroom A modern bathroom with a clawfoot tub and waterfall shower awaits. 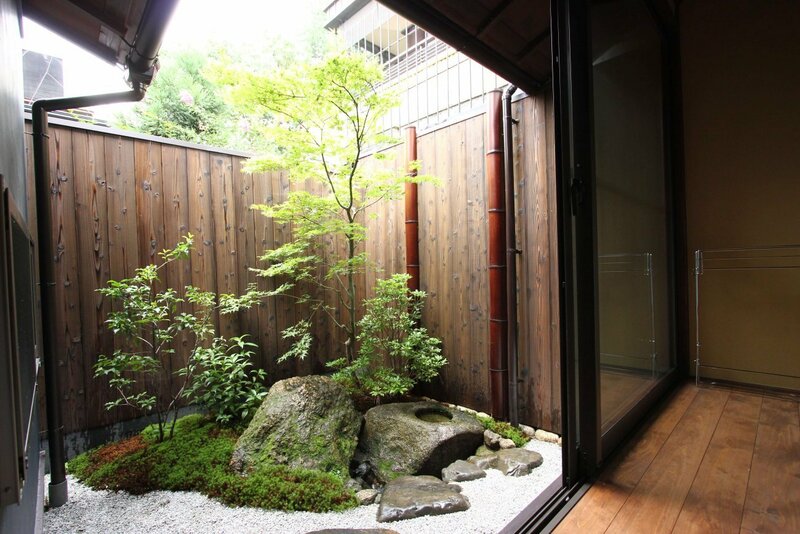 Soothe your mind and body from the day's travels as you gaze into the beautiful, private 'tsuboniwa' garden. 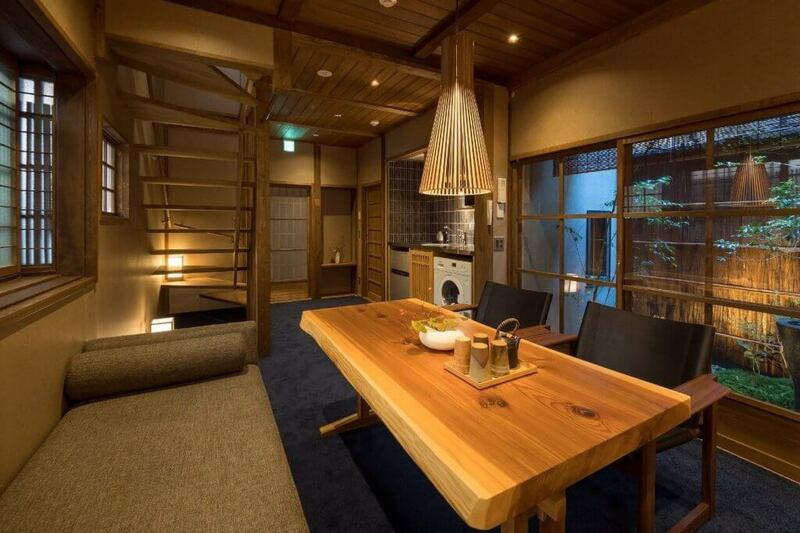 A machiya house decorated with custom-made furniture -- "Geppaku-an" will offer an experience that cannot be experienced anywhere else. 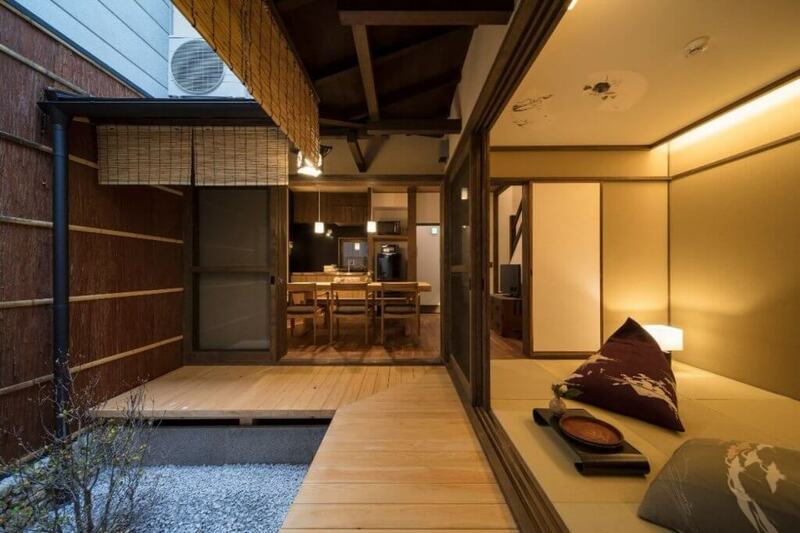 This traditional Kyoto house is located to the north of Gion, and to the east of the main shopping & dining area. It is the perfect place for guest who are looking to truly immerse themselves in the local lifestyle, and escape from the busy city life. With several subway stations nearby, you’ll be able to explore every corner of Kyoto city with ease. Head “Higashiyama” Station, a short 10 minute walk, to visit many sightseeing areas to the West of Geppaku-an. Take the Kyoto City bus, using the one-day pass, to travel up and down the city -- you can visit the famous bamboo forest of Arashiyama, or the always popular red “torii” gates of Fushimi Inari Shrine. During your stay, we recommend that you stop by the “Furukawa-cho Shoutengai” -- a long shopping arcade that is a few minutes walk away from “Geppaku-an”. 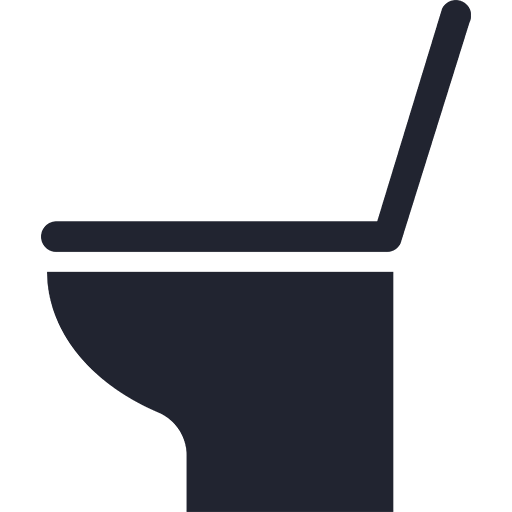 You’ll find local shops and markets, along with cafes & restaurants serving local dishes along the entire length of the street. 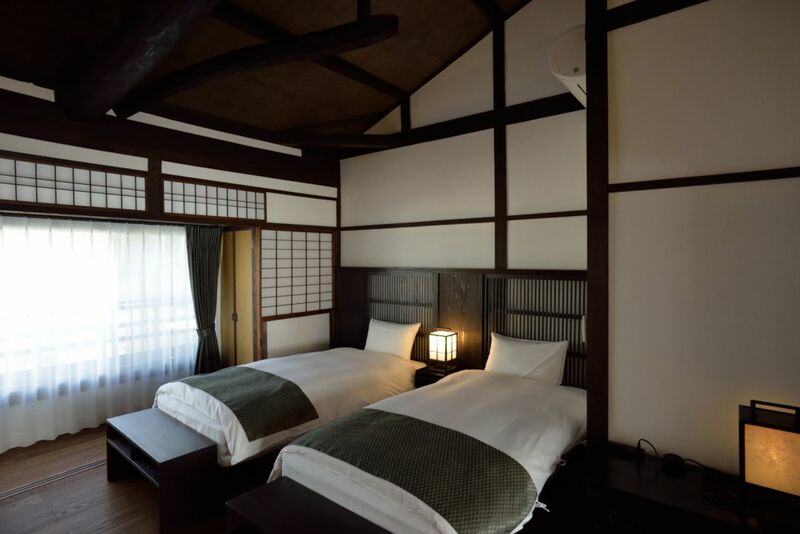 Have a taste of local life during your stay in Kyoto!